The Oakland Raiders selected Alabama running back Josh Jacobs with the No. 24 overall pick of the 2019 NFL draft. This was the selection that the Raiders acquired when they shipped defensive end Khalil Mack to the Bears last season. Jacobs split time in Alabama's backfield. He's a finisher with the rock in his hand but doesn't have a ton of breakaway speed. Jacobs is more of a north/south runner and is willing to block in all situations. He has great instincts and should be a big part of Oakland's backfield in 2019, as they lost Marshawn Lynch to retirement. Jacobs should have value in single-season formats this season, but the upside might be limited initially depending on how the Raiders utilize him. The Philadelphia Eagles traded with the Ravens and selected Washington State offensive tackle Andre Dillard with the No. 22 overall pick in the 2019 draft. Dillard is excellent at pass protection, so he'll be tasked with keeping quarterback Carson Wentz healthy for an entire season. His arm length is suspect and could hurt him, but he's got good feet and will be put on the spot right away at the next level. The Denver Broncos selected Iowa tight end Noah Fant with the No. 20 overall pick of the 2019 NFL draft. Fant is the second tight end from Iowa taken in the first round, which is a first in NFL history. 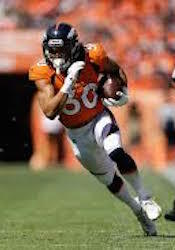 He is an exceptional all-around athlete and should immediately become the top pass-catching option at tight end for quarterback Joe Flacco in 2019. Flacco notably likes to use his tight ends as well, so Fant could come into some redraft value in his rookie season for the Broncos. Fant had 18 touchdowns for Iowa the last two seasons combined. He will help Denver's passing offense stretch the middle of the field. The New York Giants selected Clemson defensive tackle Dexter Lawrence with the No. 17 overall pick of the 2019 NFL draft. This is the pick that the Giants acquired from the Browns in the trade that sent receiver Odell Beckham Jr. to Cleveland. Lawrence is the third defensive lineman taken from Clemson in the first round, believe it or not. He was 360 pounds as a freshman recruit. Lawrence is a hog molly on the D line that will take up space and help smother the run. Despite his size, he has solid speed and an ability to push the pocket as well.